Last night on Top Rank Boxing on ESPN, we had a triple header of action, and it definitely did not disappoint. 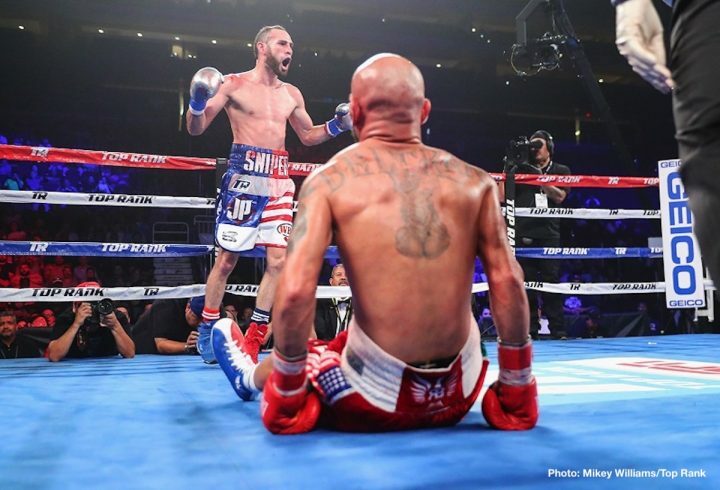 Jose Pedraza (25-1, 12 KO’s) defeated Raymundo Beltran (35-8-1, 21 KO’s) in a 12 round slobber knocker with a dramatic finish. Issac Dogboe (20-0, 14 KO’s) trampled Hidenori Otake (31-3-3, 14 KO’s), and if you blinked, you missed it. Dogboe nailed Otake with a huge left hook in the first, for the first knockdown of the fight. Later in the round, a right hand sent Otake down again, as his glove touched the canvas, and towards the end of the round, a barrage of punches forced the referee to stop the fight. Dogboe called out all the champions after the bout, asking them not to doge him. The 23 year old, was more then successful with his 1st round knockout title defense. Mexico VS Puerto Rico did not disappoint yet again. Pedraza looked to be in complete control through the first 4 round of the fight, switching back and forth between orthodox and southpaw, and sticking his long jab in the face of Beltran. In the middle rounds, Pedraza seemed to tire a bit, and it became Beltrans fight. Ray had Pedraza at close quarters, which is what he wanted, pinning him against the rope time and time again. In the 11th round however, things would shift dramatically. The fight seemed pretty even until Beltran walked right into a perfectly timed uppercut, which sent him crashing down to the canvas. Pedraza landed the perfect punch at the perfect time, and from that point on, the fight was out of Beltran’s reach on the scorecards. The final tallies were 117-110/117-110/115-112 all in favor for Jose Pedraza. He is now a 2 division champion, with the only blemish being the loss to Gervonta Davis.